We took a chance by pitching God Given (pictured) straight in to Listed company in the Betbright Aphrodite Stakes at Newmarket on Saturday following her maiden win at Haydock. However, she proved well up to the task and improved significantly on what she had done previously to come out on top by a length. She was fairly keen during the early part of the race under jockey George Wood and did well to find so much in the finish with this in mind. Plans for her are fluid in the short term, but her end of season target will be the Group 1 British Champions Fillies’ and Mares’ Stakes at Ascot in October. So Sleek was our other winner last week (at Lingfield) and our first for Lordship Stud. Obviously, we were delighted to see her get off the mark after she has gone so close on a couple of previous occasions. That win seemed to represent a bit of improvement and hopefully that will continue. 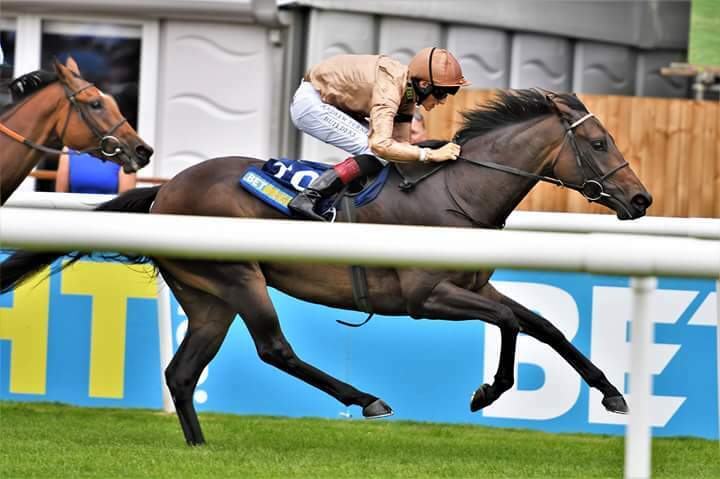 We have something like the Group 2 DFS Park Hill Stakes at Doncaster as a potential end of season target for her – race that we won in 2014 with her half-sister Silk Sari. Rigoletto failed to land the hat trick at Newmarket on Friday evening but he did endure a slightly troubled passaged through. The turn of foot that he had shown when winning his previous two starts did not seem to be there this time once he had got into the clear, which was a little disappointing, but he has come out of the race well and will be out again sooner rather than later. Mahabba finished third on her second maiden start at Nottingham on Friday. We were expecting a bit better from her, but the race, which developed into a sprint, was not really run to suit her, and hopefully she will take a step forward next time, when she may tackle a mile and a half for the first time. A busy week for us starts with Pacharana at Bath on Wednesday. She is looking for win number seven, but does have some three year olds against her, so could find things a bit trickier than when she beat older horses last time. Warsaw Road will make his handicap debut at Leicester on Wednesday, following his maiden win at Lingfield in June. Seven furlongs is the right trip for him and this looks a fair opportunity given that he is taking plenty of older, more exposed horses on for the first time and will get a handy three year old weight allowance. We saddle two runners across the country on Thursday. Bedouin will run at Newbury, despite the ground, and we are hopeful of a good run after his more professional performance at Nottingham last time. We will also send Beyond Recall to Sandown although she is a filly who we find it hard to get a handle on at home. Chief Craftsman has run well in maidens over a mile and a half on his last two starts and is set to run in a similar race at Newmarket on Friday, while we run Rosental in the Listed British Stallion Studs EBF Lyric Fillies Stakes race up at York. There is some rain forecast on Wednesday and Thursday so hopefully the ground will be soft enough for her to take her chance. Over the weekend, Paris Rooftops has potential options in maidens at Chester (over a mile and a half) and Salisbury (over a mile and a quarter), while Near Kettering is set to take on older horses for the first time in a handicap at Pontefract on Sunday. The participation of both Chocolate Box (at Salisbury) and Kitty Boo (at Pontefract) will come down to the weather, as neither will really appreciate soft ground.